Fresh for yesterday morning’s report, we decided to highlight some MMM calls on the heels of the company’s earnings report, so we put the MMM Weekly $195-202.50 Calls on the radar. 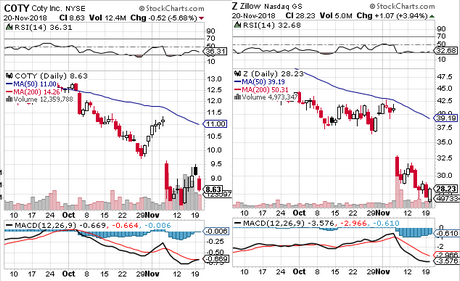 We last mentioned TROV on December 18th, and at the time the stock was trading down to an annual low of .503. Since then, we’ve seen a slow and steady recovery, which was kicked into a higher gear yesterday following news of Trovagene and PoC Capital entering an agreement to fund the development of Onvansertib in Metastatic Colorectal Cancer. The stock ended up hitting .73, marking a 45% rise since we mentioned it. We will want to continue monitoring TROV for further advances from this point forward. Our fresh options idea for the day yesterday morning was a range of puts in the TSLA chain, on the heels of its poorly-received earnings call. What resulted, as the stock began the session under duress, were some very nice opportunities for us before lunchtime. 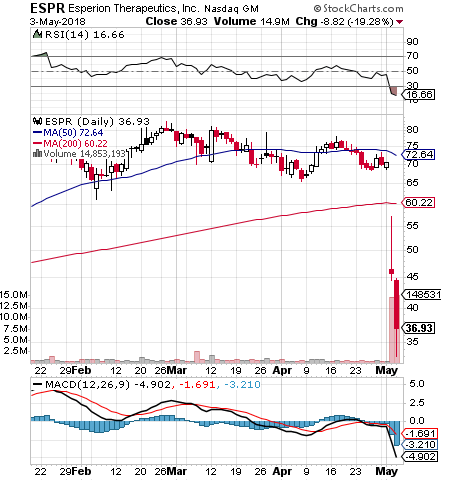 Esperion Therapeutics, Inc. ESPR – We like the look of the ESPR chart for a potential extended recovery play. As you can see on the chart the stock has been in quite a bit of trouble over the past few sessions, losing roughly half of its previous value in a matter of just a few days.We’re always looking for heavily oversold stocks in line for the chance at a big rebound. 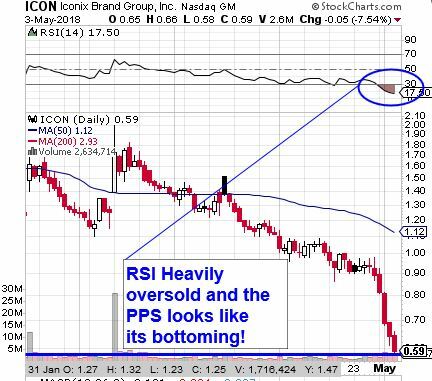 Iconix Brand Group, Inc. ICON – We also want to add this one to our watchlist. The stock has been pushed way down amid an SEC investigation concerning ICON and a famous partner of the company, award-winning recording artist Jay-Z, and his Rocawear brand. As you can see below, in addition to a more steady backslide that dates back much further, the stock has really gone into free fall in recent sessions, resulting in a scenario that could produce a significant rebound, which we’ll want to be looking for. We noticed SGYP start to sell off rapidly last week, after a poor earnings report and the pricing of a public offering on the stock with shares being offered at 2.58. 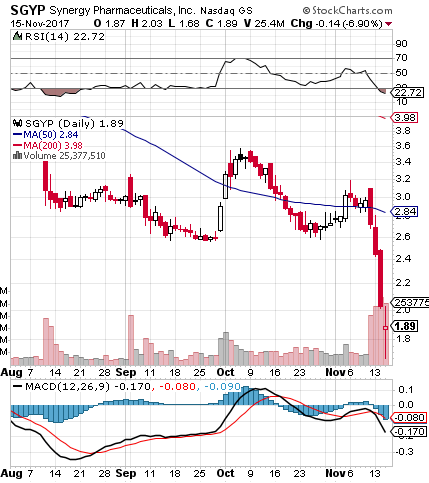 Combined with the start of tax-loss selling season, and SGYP has approached extreme oversold territory. We’ve now begun to take interest in this as a bottom watch play to monitor for a rebound in coming sessions, and it could ultimately be quite a recovery. We’ve got a stock that was trading for nearly seven dollars a share at the beginning of this year, beaten all the way down to new annual lows. If SGYP were to regain even a portion of the ground it’s lost in recent months, it would be worth our time to track it. Looking at this morning’s premarket earnings calendar, it was WMT that jumped out at us the most, with a solid beat, and heightened guidance propelling the stock to a moderate gap up at the moment. We’re going to formulate a quick options idea to try to take advantage of the situation. Walmart has been exceptionally bullish for most of this year, and is currently soaring into blue skies, setting a new annual high with every uptick. We’re going to put the WMT Weekly $92-96 Calls on watch for the remainder of the week.